eD@HoMe: A lovely Swiss cover!! Sharing with you today is a lovely Swiss cover. Many thanks to Vural Oguz! 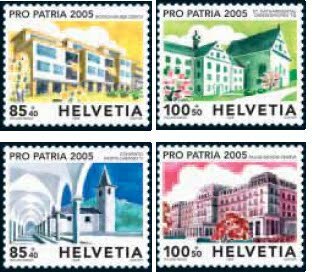 On 28th Nov 2008, Swiss Post released two special stamps devoted to Concrete Art. One of the stamps can be seen on this cover (right corner). The term "concrete art" was first introduced by Theo van Doesburg in his "Manifesto of Concrete Art" (1930). In his understanding, this form of abstractionism must be free of any symbolical association with reality, arguing that lines and colors are concrete by themselves. In support of Pro Patria's work, Swiss Post issued a set of 4 stamps titled "Historical monuments of Switzerland" to raise funds. 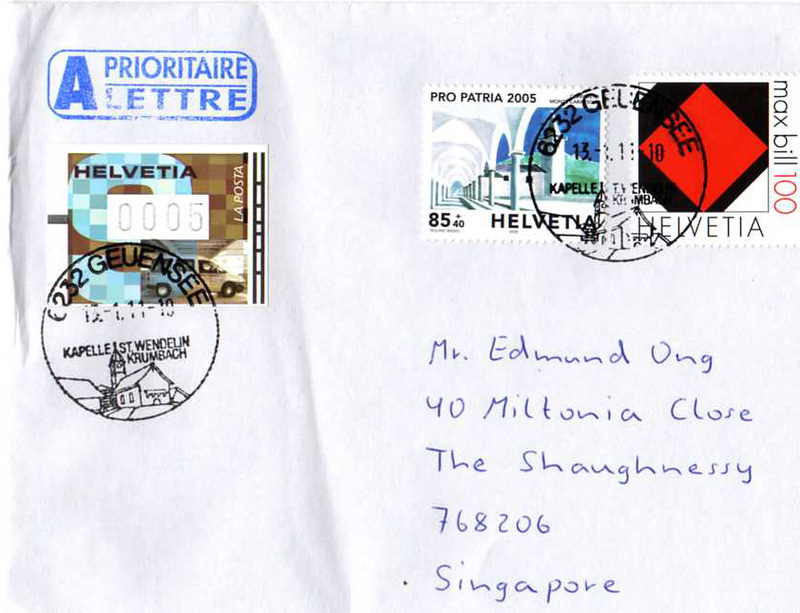 Released on 10th May 2005, the stamps feature Rotach houses, Zurich (CHF0.85+0.40) which is the middle stamp on the cover, Monte Carasso Abbey, TI (CHF 0.85+0.40), St. Katharinental Abbey, Diessenhofen TG (CHF1.00+0.50) & Palais Wilson, Geneva (CHF1.00+0.50). To make up for the postage, Vural used an ATM stamp (5c) which is part of a series of four stamps, devoted to different postal transport means. 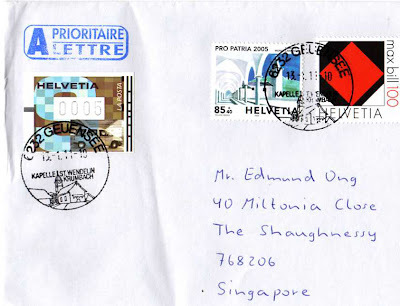 Issued on 20th Sept 2001, each of these four stamps includes one of the letters of the word "Post", the letter "S" is shown here. Also worthy of mention are the lovely postmarks from Geuensee, with the St. Wendelin Chapel, on 13rd January 2011. This cover took just 6 days to reach Singapore. Hi! You have a wonderful blog. Visit mine to see the beautiful stamps, FDCs, coins, post cards, etc at Lovely Stamp Blog. Would love to swap too?